The chess pieces keep moving. China maneuver themselves into a position from which they can claim Asia meanwhile Russia concentrates its efforts on the middle east. The US and UN continue to push and push, they will not allow any nation to stand in the way of their plan for a global government . American plans to develop a missile shield in Asia have alarmed Beijing. With 250 million Chinese officially considered poor, spending billions to challenge the US military could sink China’s economy without firing a single shot. 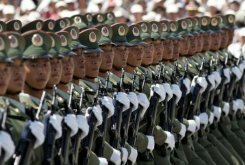 The Chinese military has voiced concern that the US missile shield plans to destabilize the military balance on the continent. In March the Pentagon revealed plans to deploy elements of its global antiballistic missile defense system in Asia and the Middle East. Such a shield would include deployable ship-based interceptors and land-based missile interceptors located in the United States’ western territories. To maintain a credible deterrence, China might have to modernize its nuclear arsenal to correspond properly to the realities of modern warfare. “It undermines strategic stability,” acknowledged Major General Zhu Chenghu of China’s National Defense University. The General first became internationally known in 2005 when he declared that China might use nuclear weapons if the US intervened militarily in a Chinese conflict with Taiwan. China established yesterday the city of Sansha on Yongxing Island in the southernmost province of Hainan. Sun Shaochi, vice-minister of civil affairs, announced the State Council’s approval of the establishment of the city at a ceremony. Luo Baoming, Party chief of Hainan province, said in a keynote speech that Sansha was established to administer the Xisha, Zhongsha and Nansha islands and their surrounding waters in the South China Sea. “The provincial government will be devoted to turning the city into an important base to safeguard China’s sovereignty and serve marine resource development,” he said. He said the main task now is to build up political power in Sansha to ensure efficient administration. A ceremony to mark the city’s establishment began yesterday morning in a square in front of the city government’s main building, located on Yongxing Island, a part of the Xisha Islands and the largest island in the area. The national flag was hoisted while the national anthem played after the signboards of the Sansha city’s government and the city’s committee of the Communist Party of China were unveiled. MANILA: Tensions over competing claims in the South China Sea could escalate into conflict, with an arms build-up among rival nations raising the temperature, an international think tank warned Tuesday. Prospects of solving the disputes “seem to be diminishing” after a recent failure by the 10-nation ASEAN grouping to hammer out a “code of conduct” that would govern actions in the sea, the International Crisis Group (ICG) said. “Without a consensus on a resolution mechanism, tensions in the South China Sea can easily spill over into armed conflict,” warned Paul Quinn-Judge, the ICG’s program director for Asia. THE AMERICAN’S THE NEXT ECONOMIC VICTIMS…….OR ARE THEY?! China has appointed military officers at a newly established garrison in the South China Sea, state media reported on Friday, marking the country’s latest step to bolster claims to disputed islands in the area. Chinese soldiers take part in a 2004 military parade to mark the establishment of a miltary barracks in Hong Kong. China has appointed military officers at a new garrison in the South China Sea. The defence ministry announced the appointments on Thursday, the China Daily said, two days after China said it had established the city of Sansha on an island in the disputed Paracel chain, along with the military garrison. China’s neighbours reacted furiously to the move with Vietnam, which also claims the Paracel Islands, filing a formal protest and saying it “violates international law”. The Philippines, which is involved in a dispute over another archipelago, the Spratly Islands, summoned the Chinese ambassador to lodge a complaint against the garrison announcement. Good. Time for a new Cold War? Well bankrupt Amerika and Nato running dogs ( thanks to Mao! ) Will you spend your way to military supremacy and bankrupt China in the process as happened with the USSR? This time it will be different. These countries have learned, watching patiently. Does it ever enter the collective corporate noggin that it may be they are being drawn into a trap? I doubt it. What the Chinese remember are Opium Wars, humiliation and invasion by foreign powers. They will not let that happen again. The Chinese have been winning the PR war with many governments.Their policy of investment with out interference has been welcomed by many. If this does turn to military action those nations will want to keep their biggest backers. Regions of investment become allies in war. The Chinese are making moves in and winning the resource war, which i think contributes largely to western nations wanting to rein them in, if left unchecked or challenged they will swallow the world. It is an interesting view. Genghis ( although not Chinese! ) managed to get to Hungary and the near east. Only his death caused The Horde to retreat.